Kieran Keane’s men now lead their Challenge Cup pool after four wins from four. Matt Healy celebrates with Eoghan Masterson and Darragh Leader. CONNACHT DEMOLISHED BRIVE at the Sportsground as Matt Healy helped himself to four tries on a great European night for the home side. 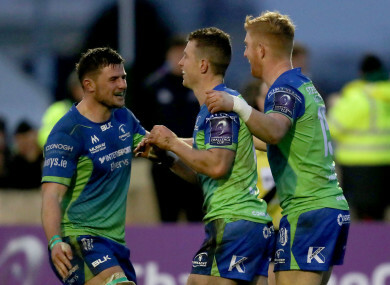 A fourth win from four games in the Challenge Cup means Connacht lead their pool by seven points and a win in Sixways against Worcester Warriors will wrap up a slot in the last eight for Kieran Keane’s side. Jack Carty was in top form for Connacht with a sharp play-making display, while he also powered over for a first-half try and kicked all nine of his shots from the tee in a 25-point personal haul. But the night belonged to Healy who brought his European tally to 19 tries in green in a top drawer display. His first came after five minutes when he somehow caught Carty’s crossfield kick one-handed to score behind the posts. Carty’s try meant Connacht led 17-10 at half-time, but Healy finished off an efficient set play after 50 minutes to stretch their lead. The winger completed his hat-trick in the 59th minute when he chased down Pita Ahki’s chip through, and after replacement Kieran Marmion got in on the act with a try a minute after his arrival, Healy bagged his team’s sixth try in the closing stages. But there was still time for Carty to produce another moment of magic as his quick penalty sprung the Brive defence one more time and Tom Farrell ran in the final score. It was ruthless in the end from Connacht, but had Brive managed to build on Gaetan Germain’s try, conversion and penalty before the break, they could have worried the home side. Instead, Keane’s side claimed a second Challenge Cup bonus point win in a week and face into next weekend’s inter-pro derby with Ulster at the Sportsground with renewed optimism. Connacht scorers:Tries: Healy (4), Carty, Marmion, Farrell. CONNACHT: D Leader, C Kelleher, P Ahki, B Aki (T Farrell, 60′), M Healy, J Carty, J Mitchell (K Marmion, 58′); D Buckley (P McCabe, 36′), S Delahunt (T McCartney, 46′), F Bealham (C Carey, 46′); U Dillane (J Cannon, 65′), Q Roux; C Gallagher, J Connolly, E Masterson (c). BRIVE: G Germain (T Laranjeira, 60′); N Megdoud, A Mignardi (c), B Petre, F Romanet (G Namy, 51′); M Ugalde, F Cazenave (D Delarue, 68′); V Devisme (K Asieshvili, 49′), M Tadjer, D Bamba (J Johnston, 49′); J Snyman (J Le Devedec, 68′), J Uys; P Narisia (S Koyamaibole, h-t), D Waqaniborutu (L Martin, 53′), E Herjean. Email “Healy bags four tries as Connacht make light work of Brive ”. Feedback on “Healy bags four tries as Connacht make light work of Brive ”.